By now, many of you have probably already seen this wonderful, masterpiece of work done by “Messianic Thug Life”…. Right. Because YOU and countless other “teachers” out there haven’t talked about ANYTHING ELSE but Christ and Him crucified? 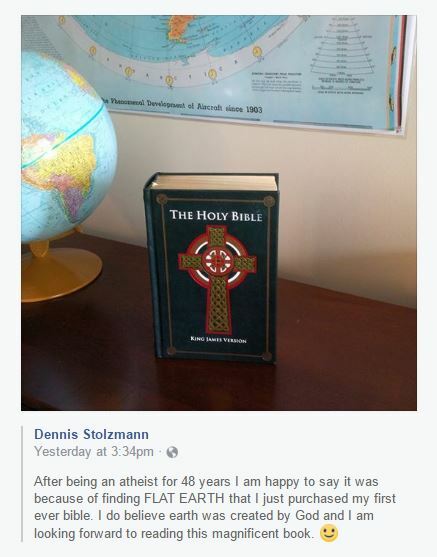 NO OTHER topics have EVER been discussed by you or Bill or virtually EVERY OTHER “teacher” out there – in the “Messianic movement” or otherwise? This video is cleaver and “funny” to some I’m sure. But it is an extreme misrepresentation of truth. For one thing, it’s easy to grab sound bites from candid conversation and make it look like that’s the ultimate truth in a situation. More importantly, the CLAIM that these topics allegedly push Christ into the background and the ASSUMPTION that these things do nothing for the advancement of the Kingdom could not be further from the truth. I have HUNDREDS (if not thousands by now) of testimonies from people who have come to Messiah (MANY being former atheists), who have begun to walk in Torah, who are now reading their Bibles again or for the first time, with new or renewed excitement and who have come into a much closer walk with YHWH through these topics. I get testimonies DAILY in e-mail, Facebook and YouTube comments, hand-written letters, phone messages, etc.. DAILY. But you people (Torah terrorists being the worst) put on your self-righteous hat of judgment and claim you know better? You are the hand saying to the foot, “I have no need of thee.” You bear false witness and throw stones in a glass house and feel justified for doing so. Videos like this and people like Bill and others are the ones being “divisive,” hypocritical, one-sided, Pharisaical, judgmental and hurtful. What’s really wrong with this “movement” is clearly reflected in both this [Bill Cloud-Thug] video and in the comments below it. Christians have the only army that assembles its firing squad in a circle. It is prone to being the hand saying to the foot, “I have no need of thee.” It judges in EXTREME IGNORANCE based solely on false witness, hearsay, and self-righteous hypocrisy full of uniformed opinions. But whatever. 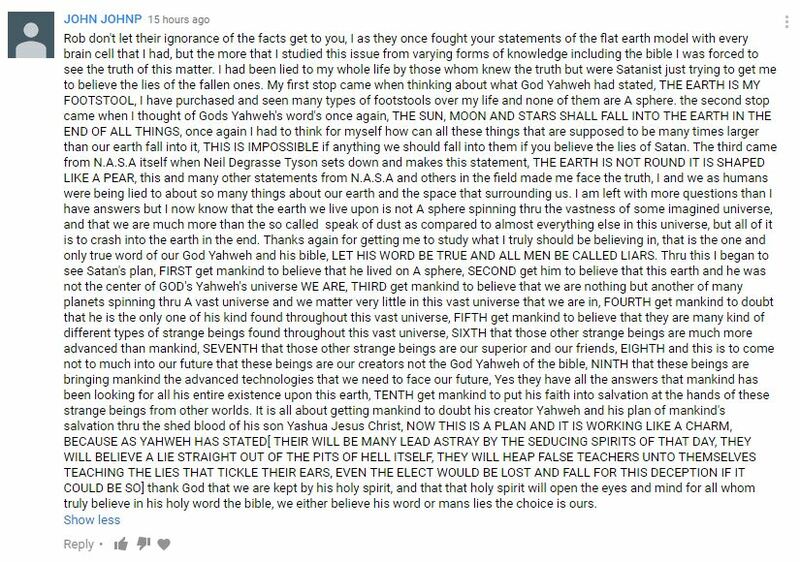 I have THOUSANDS of testimonies and more coming in DAILY of people coming to Messiah (MANY being former atheists), to the Bible, to YHWH and HIs Torah all as a direct result of YHWH using my work on these topics to draw people to Himself. I’m not saying this to boast, but rather to expose the LIES of those claiming these things do nothing to advance the Kingdom or to draw people to Messiah. Those claims are uninformed and easily proven false by REAL fruit. Whereas, I wonder how many people come to Messiah from videos like this? I wonder how much the Kingdom is advanced and YHWH is honored by Christians bashing their own? By the way Bill Cloud, Maria Merola, Natan Laurence, Thug freaks and company… you claim to be all about the Torah… well MOSES is the one who kicked off the whole FE discussion in the FIRST chapter of the FIRST book in your Torah/Bible. And if you think Genesis 1 even remotely supports your precious spinning, heliocentric, globular Earth model, you are beyond delusional. Start with an in-depth study of the FIRMament and go from there. If YHWH felt the need to inspire Moses (or to dictate to him) the nature of our cosmos, right from THE BEGINNING of our sacred Scriptures, then… maybe… just MAYBE it might be an important topic to HIM. And the narrative NEVER changes in any description given by any author of Scripture who wrote anything concerning the nature of the cosmos, from Genesis to Revelation. Do these not count for the advancement of the Kingdom? Are you going to spit in the face of all these testimonies, which again are but a TINY FRACTION of the many more, which have come in over the past two years. And if you still need more, please visit my testimonial page on TestingTheGlobe.com. Do you really need more testimony from people who have accepted the blood of the Lamb for their salvation? Because I could do this all day. It would take a LOT of time to show you all of the “fruit” that has come from this research. But of course, most of you armchair critics and Pharisaical nut bags will totally ignore all of this. 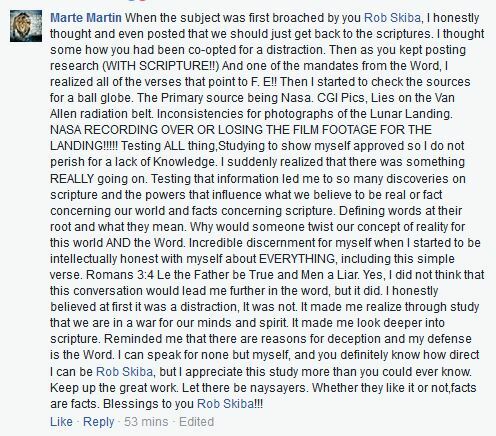 Instead, you will follow the likes of Maria Merola who claims these testimonies are not valid (see my previous Facebook note) . She is obviously just as insane as Maria, the source from which she got all of her misinformation. In fact, it is more than obvious that all she was doing was reading Maria’s “open letter” and parroting her “obsessive” Facebook rants, acting as if it was coming from her – which in most circles would be called plagiarism. But to clarify for starters, uhmmm no. I did not come “out with this at the Revive Conference.” For one thing, I wasn’t even a speaker at that event. Rico Cortes could easily confirm this if you don’t believe me. I was just attending it. Second, I was only 1 month into my research at that point and not even convinced of it at that time myself. Of course, these two self-appointed, judgMENTAL freaks (Maria and Wendy) would know this if they actually had any clue about what they are saying. This comes back around to the ridiculous accusation that I’m allegedly not feeding the sheep and that I am not preaching Christ crucified. Again, it is just further proof of their delusional insanity. And yes, I will call it out for what it is. It’s utter nonsense, not supported by anything except the rantings of deranged lunatics. 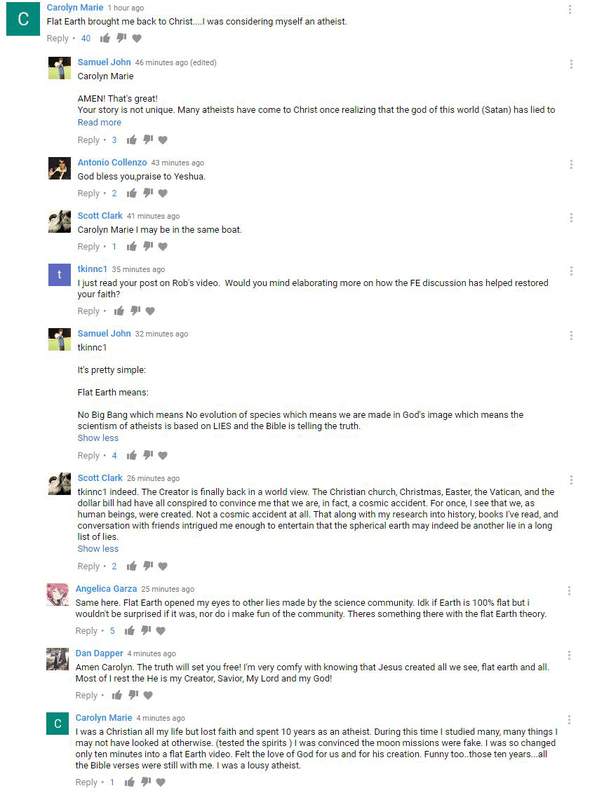 But along these same lines, looking at the MANY topics of this person’s YouTube channel, I can see that she likewise does NOT PREACH CHRIST CRUCIFIED as her ONLY topic. So, this makes her a hypocritical pot calling the kettle black. And I would apply this same assessment to nearly ALL of my detractors who consider themselves teachers. Name one teacher you know who ONLY preaches “Christ crucified” and NEVER teaches on ANY other topic. You can’t even make the claim that the Apostles of Yeshua did that. There are LOTS of topics discussed in the Gospels and Epistles and in the entire Bible for that matter. So, this is an exceptionally lame argument. In the SkyWatch/Prophecy in the News crowd (and associated spin-offs), you have guys like LA Marzulli who spends most of his time talking about aliens, UFOs, conehead skulls from Peru, the black-eyed kids, Nephilim and of course his famous line, “prophecy, politics and the supernatural.” Tom Horn is well known for his work on transhumanism and of course Nimrod and the Nephilim. Steve Quayle same thing. Now, don’t get me wrong, I think these guys have done some exceptional work in these fields, but where’s the outcry against them for not preaching ONLY “Christ crucified” all the time? Why aren’t they yelling at each other about supposedly causing “distractions” and leading people away from the Gospel? In the “Messianic” and “Torah” teaching crowd, you have everything from an obsession with the Temple in Jerusalem, to the over glorification of the nation state in the Middle East calling itself “Israel,” and endless justifications for the so-called Star of David. You have constant in-depth teachings on the Levitical priesthood, the sacrifices, the robes, the tools, etc.. You have teachings on the “two houses” of Israel along with constant study on “Hebrew word pictures” and on and on it goes. Again, don’t get me wrong, most of it is REALLY GOOD stuff and things that really do help us to better understand our “roots” and walk with Yeshua and all of that. But is it ONLY “Christ crucified” that these guys are teaching ALL THE TIME without exception? Absolutely not. But where is the outcry against them for being a “distraction” and not ONLY sharing the Gospel message? 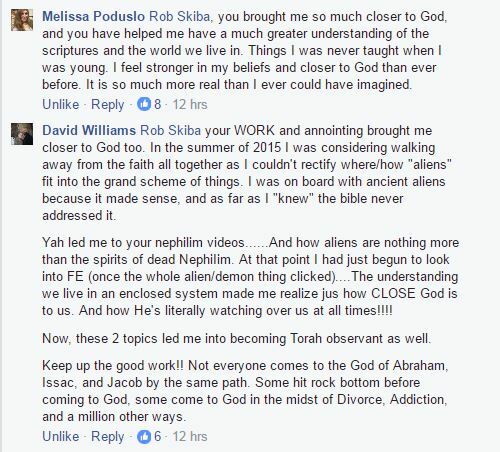 I hear many in the Torah community especially calling Nephilim and flat Earth a “distraction” and a waste of time and worse. Yet the Torah STARTS off with an enclosed world cosmology in the first chapter of the first book no less! In the third chapter, we are introduced to the Serpent and his plans to corrupt YHWH’s creation, setting off a “seed war”. By the time we get to the sixth chapter of the first book, we have Nephilim, leading to the corruption of all flesh, which was the catalyst for YHWH’s judgement with the Flood. Nimrod shows up after the Flood in the tenth chapter and in the eleventh, we have the Tower of Babel. All of that is the set up for the story of Abraham, Isaac and Jacob. The rest of the Bible is the story of their offspring, leading to the Messiah. From there, we progress into His final victory over everything established against Him in the first eleven chapters, culminating with the sky dome opening up (receding away like a scroll) and ALL OF THE STARS falling to Earth. Sorry. No. That’s not what happened. And no. It’s not about me allegedly making a name for myself and getting rich. Both statements are patently absurd. There’s no “fame” in this. This subject draws CONSTANT rebuke and mocking. I could think of a million, far better ways to “make a name for myself” and to become “famous” if that was really my goal. And as far as this allegedly making me rich – LOL! Where do you people get such a notion? Those who believe and say such things are completely out of their mind. First of all, who is allegedly paying me? I’d really like to know so I can track down their accounting department and find out where all my paychecks have been going. You think YouTube is paying me a fortune? LOL! OK. Just set up a channel for yourself and try it. You’ll get a wake up call pretty quick. I’ve had my YouTube channel for about 4 years now. When I take my TOTAL earnings from all of the videos I’ve posted, with all of the views I’ve had, and divide it out by the number of days since my channel has been up, it amounts to a DAILY paycheck just barely comparable to what I used to get paid per HOUR for the exact same type of work in the corporate world. Heck, when it comes to video production, I used to make nearly $3,000 over a weekend just doing wedding videos – all while not having to deal with any of the crap I’ve put up with for over half of the time I’ve had my YouTube channel. Sorry, but no. My YouTube earnings pale in comparison to anything else I’ve ever done – especially in the video production world. So trust me, no one is getting rich over here off of this stuff – especially not from YouTube or Google AdSense. And at least as of this writing, I don’t have any books, DVDs or other products for sale regarding FE, so I’m not making money that way either. Aside from the occasional sales of my books and DVDs that deal with other subjects, any money that has come in to us these past couple of years was largely from the generous donations of people who felt led by YHWH to write a letter of encouragement to me and occasionally send a check along with it. Period. Regarding our financial supporters, let me take a moment here to say a heart-felt and extremely sincere thank you from both Sheila and I. YHWH has been our provider more times than I can count, but most often He does so through people like you. There were numerous times over the course of the past two years, when I had absolutely no idea how we were going to make it through the month. But then, to our pleasant surprise, we’d find a check or two or three waiting for us in my PO box – often in the exact amount we needed, and sometimes with more to spare to carry us into the next month or to pay for some need as yet unknown but soon to manifest (such as when our washing machine broke and flooded our apartment or when we’ve had car troubles). So thank you for your love, support, kind letters of encouragement and financial assistance, and for being obedient to answer a call in the Spirit to help us when we needed it most. I can honestly say without reservation, we could not do what we do without people like you. To my accusers, let’s quit with this business of making up unsubstantiated claims, followed by ridiculous accusations, which amount to the hand saying to the foot, “I have no need of thee” and being the true constant source of division. I’m doing what I KNOW I’ve been called by YHWH to do. And the fruit of my labors speaks for itself. Where’s the fruit of all the accusation, mocking, bearing false witness and armchair criticism? Care to compare fruit baskets? This is not a time to be divided and hateful. We should be able to disagree agreeably without attacking our own. Ignore prideful trolls in the flesh & christians possessed by demons. REAL biblical creation has my family now talking to each other. It’s brought us closer to each other the creator & his words. You are greatly loved and appreciated brother. Your recent conference video recorded in Amsterdam is just about the most excellent, all encompassing unveiling of truth I have ever seen, (and I have watched MANY). Never give up, and please consider getting some counselling/inner healing type ministry to remove any fiery darts that still remain. Great post Rob. You do what 99% of us couldn’t do or handle. If only your detractors could walk in your shoes for one day. Maybe then they would change their actions toward you. You know quite well that you have many many people that fully back you up. You have been called for this. Keep it up! I look forward to hearing more from you. 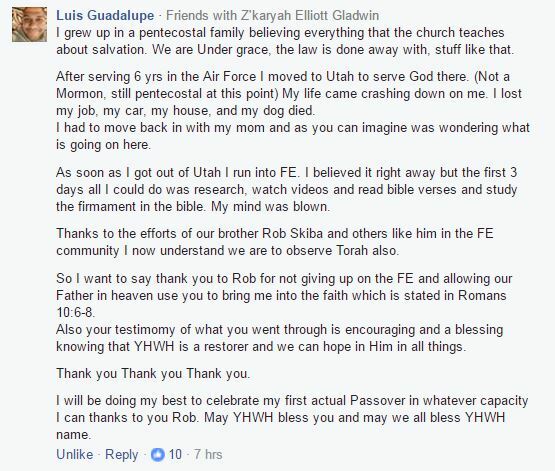 Rob, I truly love your videos, and believe many have come out of their darkness and into the light of Messiah over the FE issue. I mocked it for years, and then one day made a comment that “we’ve seen the earth blah blah blah” and the response of “no you haven’t. You only think you have, but there is not one picture of the earth from space, go look it up”. I did just that, and became a firm believer we are in a strong delusion set up by Ha satan to take us away from our Father in heaven. I get called a know it all a lot when in debates with people, and I point out “aren’t you pointing three fingers back at you as you point at me? Aren’t you a know it all for disagreeing? You see, their focus on you and this study is not focusing on “Christ crucified” and only teaching that is it? So, are they being a hypocrite and a liar? Yes, they are. They are proud and angry. They like their delusions, and are kicking against God, no you. Keep up the good word brother. Thanks again Rob for all the effort and research you do. The work you were called to do definitely is blessed by YHWH and cursed by the adversary. Just keep in mind the admonition from Father to stop defending his word, just publish it and let it speak for itself. You are my favorite researcher, largely because of your humble spirit as you dig into things the Lord puts on your heart. I love the way you question what is routinely taught and accepted. You have made my spiritual life deeper, richer, more expansive as the reality (not just the stories) of scriptures comes to life. You are a rockstar in my family!! Oh dear…I doubt you have any grasp of reality whatsoever. As many others have said, I first learned about FE from Rob. I was researching Gen. 6 and found him and several others. Then he mentioned FE and I was off on a trip to settle some questions I have had since I was a child. I have followed the experiments by many and talked to my kids and grandkids. My oldest daughter settled it. She said, “I don’t need to see the experiments and stuff, if the Bible says it is flat (and it does) that’s all I need to know.” So we are working with the grandkids to understand truth. I pray for you that you will continue your work, and maybe ignore some of the ignorance that these people spew. I think they are worse than the “unbelievers” because THEY are the ones who are sowing discord. They need to let it go. Because they are “protesting too much” as Shakespeare said, it tells me that they are very insecure in their own faith that they have to attack anyone they don’t agree with. They actually remind me of the Westboro Baptist Church people who will not let things go and attack anyone who does not agree with them. Anyway, bless you as you continue this journey. It will not be in vain. It was a “distraction” topic that brought me into the understanding that the whole bible is relevant for today. It was a youtube video talk on Babylon rising and the paganism ingrained in our culture, specifically in D.C. My life is completely different today, trying to truly follow and emulate the Messiah now, because of the rabbit trails that “distraction” topic took me down. If all I continued to hear was “Christ and Him crucified” I would still be bound up in my paganism and giving YHVH, Nimrod worship. I knew about the sacrifice, but I had no foundation to understand it. How can building a foundation be a distraction? I’ll never understand that. The people that harp on you about how wrong it is to talk about any topic other than the cross makes me think of Yeshua’s words in Matthew 7:2, “For in the way you judge, you will be judged; and by your standard of measure, it will be measured to you.” We ALL better be careful about being hypocrites. Do WE judge others more harshly than we judge ourselves? Because we are going to be judged by the standard we set for others. Ouch. I know you took quite the financial hit when you started sharing your FE research. Looking back over it, I think part of the reason why is that the support for the other topics that you DO have books and DVD’s on, waned. A large percentage of your social media turned focus and so you weren’t as actively watering those other seeds. I know that you took a dramatic, quick drop in sales so this isn’t the total answer but I think it plays a part. Just like in life, the plants you water grow and the ones you don’t die. If you started promoting those other topics with more vigor, putting out new material, your book sales would most likely go up. I’m not saying to stop the FE stuff, I love your FE material. I’m just saying perhaps PART of the reason for the drop in sales, could be, you slowed down watering the seeds in those areas to focus on other seeds. And as you said, you don’t have anything for sale in the FE arena. On a side note. What?? You’ve never heard of Cedar Point?? It’s only the roller coaster capital of the WORLD. (at least they say so 😝) I’ve been going there my whole life, I live close to it. It would be super fun to someday take double date there. Wouldn’t that be a cool first meeting?? Keep up the good work. So many of us appreciate what you do we are just not as vocal as your detractors and armchair critics and unfortunately you mostly see the negative but highly vocal crowd. I find it baffling that people say that it doesn’t matter about the shape of earth. It matters if it’s the truth and we believe modern Science then God’s word is a lie. That’s a big deal. As far as it not being a salvation issue the disciple were asked “what must I do to be saved?” They responded “Believe in the Lord Jesus Christmas and you will be saved. You and your house”. When we fail to believe what God is telling us we are not believing in Him. We are believing the wisdom of this world which God says is foolishness to Him. Failing to look at the nature of the sun moon stars and the earth is to deny the foundations of our bible and failing to believe in the Lord. We are choosing to believe the wisdom of this world and denying what God is telling us. Seems like a bad idea to me. And it seems important and far from a distraction. It’s kind of an all or nothing deal. You either believe 100% in God or you throw the whole thing away. This includes the shape of the earth and nature of the universe. I posted this in Messianic Thug Life. Anyone who continues to proclaim or even infer the information and topic of the nature and true representation of Yahuah’s creation is an unimportant distraction simply proves their pontificating spiritually immature opinion is what is in fact the unimportant distraction. Oh please Jerry, you’ve denied Christ on facebook, so you’ve got no room to talk. First thing I notice is the Dagon/Star of Remphan attached to a Menorah. I would think YHWH would be slightly pissed off about that, but I know one of the messianic churches that was promoting the thug video on FB has a giant Star of Remphan flag on their stage at church. 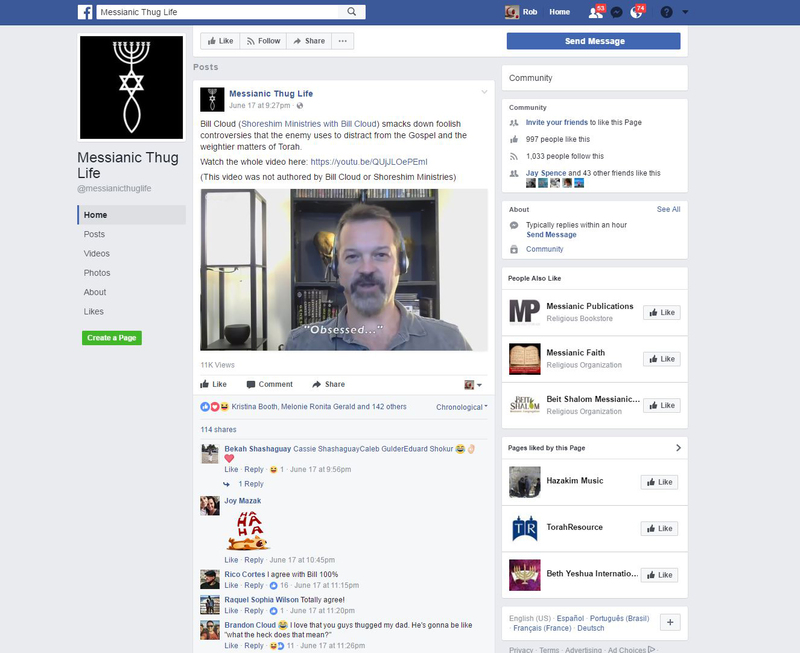 Also, “Messianic Thug Life” is one of the more ignorant things I’ve ever witnessed, as Thugs originated in Hinduism with Kali worshippers. *shrugs* YHWH give you peace and joy Rob. Keep up your work. The Flat Earth is a good topic but milk. Why won’t you deal with what the bible says about gender relations? This is the number 1 reason why the church is crumbling right now: feminism. Grow a pair and do some real work in peoples lives. Flat Earth won’t fix the church and it won;t fix the families in this country. Show me the testimonies that would say that is a topic MORE POWERFUL to address than this. Thanks. So, how do you explain the issues brought up in this video? You have made me aware of so many different things that I should be paying attention to, and as a new Christian, I appreciate your research and explanations on the multiple topics you have covered that truly need to be heard and talked about. The Holy Spirit does not lie and every time I listen to you I am welcomed by overwhelming truth and surrounded by The Holy Spirit. I do my own research and look at all aspects. Thank you very much for all you do! Keep up the awesome work of building YHWH’s followers in faith with Christ. I praise YHWH for leading me to you.